As a means to reach the objectives of the LiWa project, cooperation between scientists, planners, private and public companies, governmental agencies and NGOs is indispensible. Given the challenges of climate change, the traditional hierarchical decision structures coupled with the fragmentation in public and private services proves to be inefficient as well as socially unacceptable. The transition from the traditional decision making style towards a more cooperative and synergistic governance model is key to the modernisation process under conditions of high uncertainties. Stakeholder involvement throughout the whole governance process has the particular advantage of promoting the accountability and transparency of the decision making process. Participants get an inside view in the decision-making process and become co-responsible for the decisions that are taken (ownership). This may lead to “better decisions” as it enriches the decision-making process with relevant viewpoints, interests and information and is instrumental in a learning process. 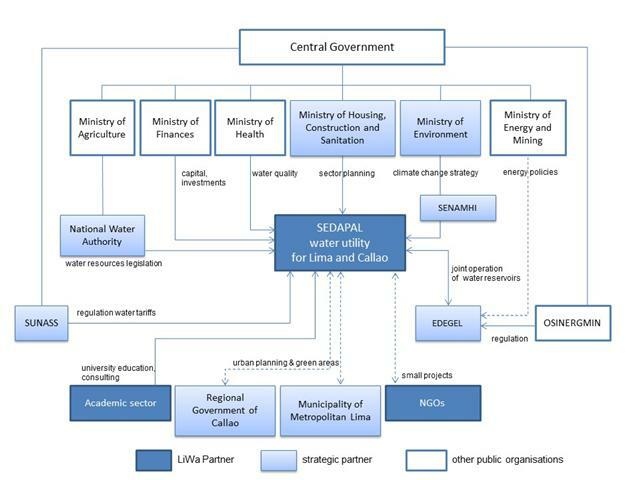 The governance approach in the LiWa project is inspired by the idea of inclusive governance (Renn and Schweizer, 2009). It consists of a combination of functional input by experts, deliberative evaluation by stakeholders and open dissemination to all groups affected. The integration of knowledge (basically experts), preferences (the affected population), values and interests (stakeholders) is the major objective of all participatory procedures. Rather than amalgamating all input into one model, our approach distinguishes between scientific input, stakeholder interpretation/evaluation as well as public needs. The incorporation of these different inputs is handled by a variety of interlinked procedures: the experts have their own meeting platform and are obliged to act as witnesses and resource persons to the other platforms; the stakeholder input is organised in forms of Round Tables and the public preferences are addressed through the ambassadors meetings. It is important that the overall process provides ample opportunities for each participant to contribute what is needed for making the process effective and efficient and the outcome competent. Any input that improves the decision making process, facilitates the deliberation process and adds new insights and ideas to the problem solving exercises. Within the LiWa project, a wider communication platform has been established with the goal of outreach to a larger stakeholder segment including governmental agencies, ministries, NGOs and scientific institutes. The project team implemented the concept of “LiWa Ambassadors”, an innovative instrument to combine personal commitment with broader dissemination. Locally known opinion leaders provide local (institutional) knowledge to the project team on the one hand and disseminate the project’s results to a wider audience on the other. During the first project phase (2008-2010) the LiWa Ambassadors met once a year and discussed the results of the project and further applications of the results. They were also instrumental in linking LiWa with other similar projects and initiated further activities in the water sector in order to popularise the project in the relevant communities. The combination of scientific analysis and multi-stakeholder deliberation lies at the core of the LiWa project. 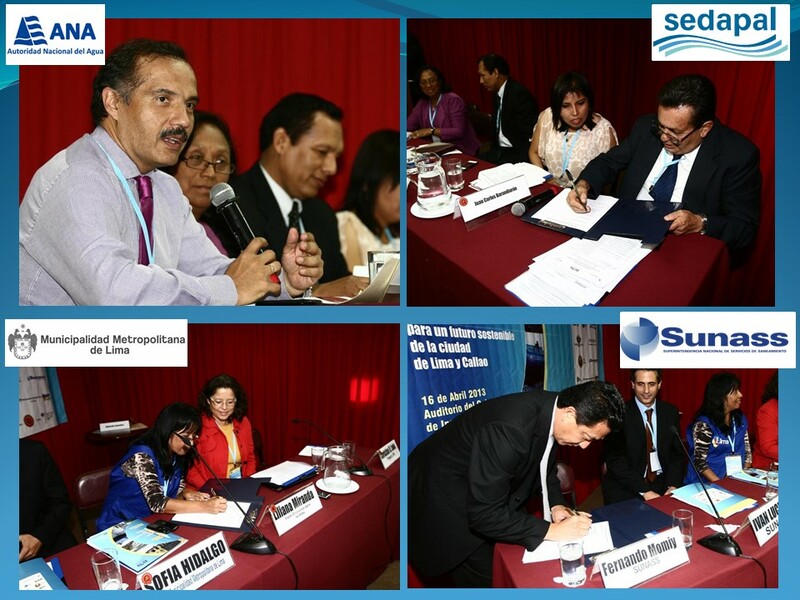 For the second project phase (2011-2013), several Round Table discussions have been organised with major stakeholders in the water sector of Lima (public sector, water utility company, private sector, civil society). 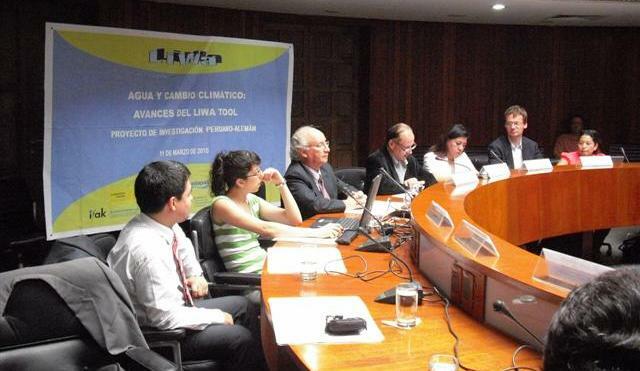 The topics were the following: Water and Climate change (06.10.2011), Scenarios for Lima and Callao (15.03.2012), Tariffs and Alternative Water supply (17.10.2012) and Evaluation of measures (22.11.2012). The deliberations during the Round Table discussions furthered the integration of the "LiWatool" with the construction of the Scenarios. These two inputs are essential for developing feasible and acceptable strategies towards sustainable water management and climate change adaptation. 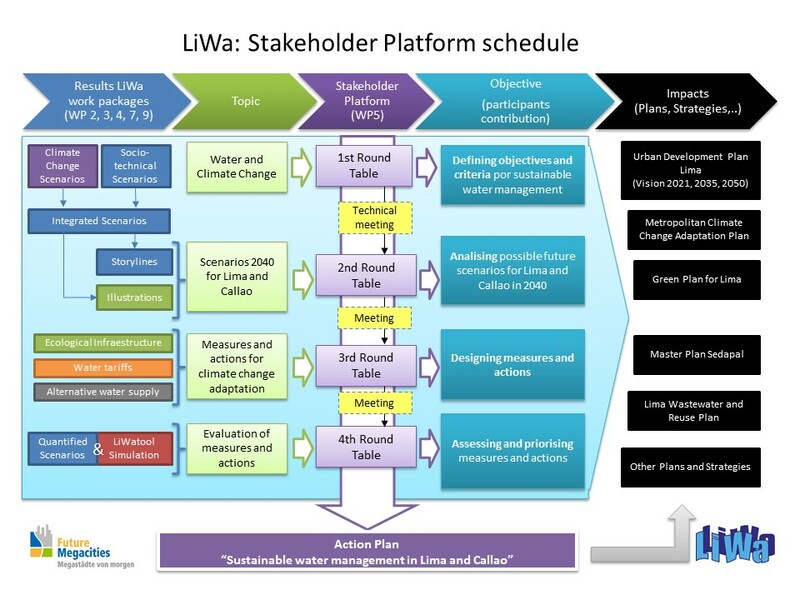 As a result of the application of LiWa instruments together with participative processes, an "Action Plan for Lima and Callao" ( pdf file) has been formulated and agreed upon by main city and water governance actors at a conference in Lima on April 16th, 2013. It includes concrete measures and tasks to put into action within the next years and explicit defines responsible actors.